With my twins starting preschool this month, mornings are about to get a whole busier. Managing back to school mornings with four kids doesn’t happen without preparation. Oh no. This mom started getting her morning routine figured out weeks ago and put it in to effect August 1st. So far I’ve been greeted with groans but come the first day of school they will thank me. Maybe… If you have several kids you’re sending off to school in the mornings, I’ve got some tips to help you manage them. 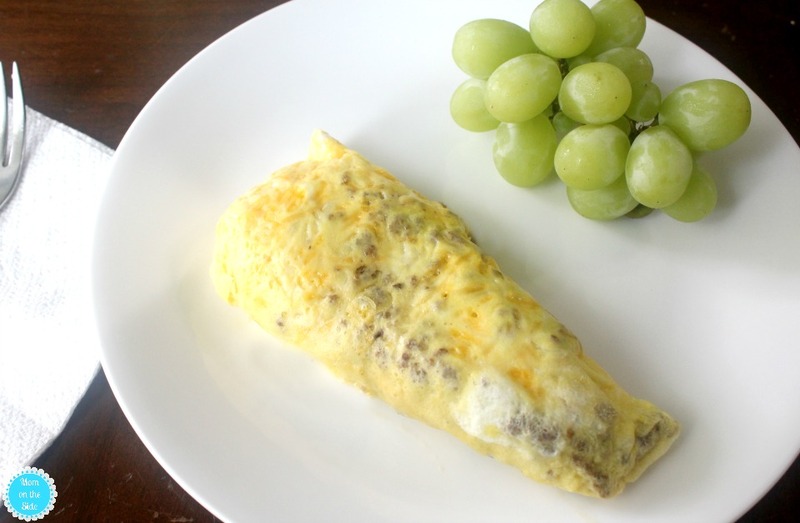 Along with a quick and easy Cheesy Sausage Omelette in a Bag made with Horizon® organic milk and shredded cheese! Having four kids at three different schools with three different start times already makes the morning spin. Write down and post a schedule to keep things in order. Hanging it at the command center or on the fridge so it’s visible, and everyone remembers when it’s time to leave. Practice the back to school morning routine at least a week before school starts. We started three weeks out mainly to get sleep schedules back on track. This week I will be taking a practice drive to each school ensuring I’ve given myself enough time before the bell rings. It’s a great idea especially if you are dropping off at a new school, or more than one school. Talk to the kids about the back to school morning routine. Ask them what does and doesn’t work for them and how early they need to be at school. Maybe there is only one bathroom and someone would prefer to use it first. Maybe there is a school club meeting in the morning that requires an early drop-off. Keeping kids involved in the back to school morning routine helps avoid any surprises or problems. Keep some easy breakfasts in your arsenal for busy mornings. 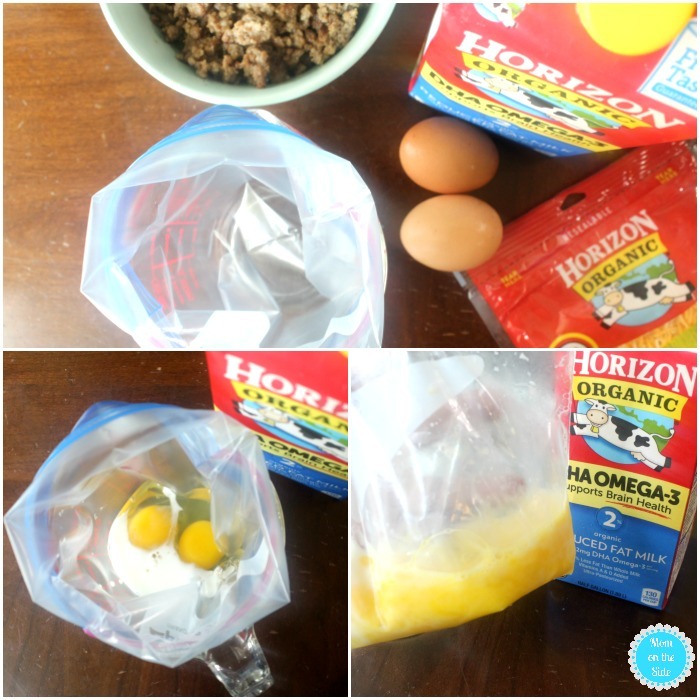 Omelettes in a Bag are a great way to have a filling breakfast without a lot of work. You can even make them ahead of time and have bags with omelettes in them ready in the fridge, like this Cheesy Sausage Omelette in a Bag. 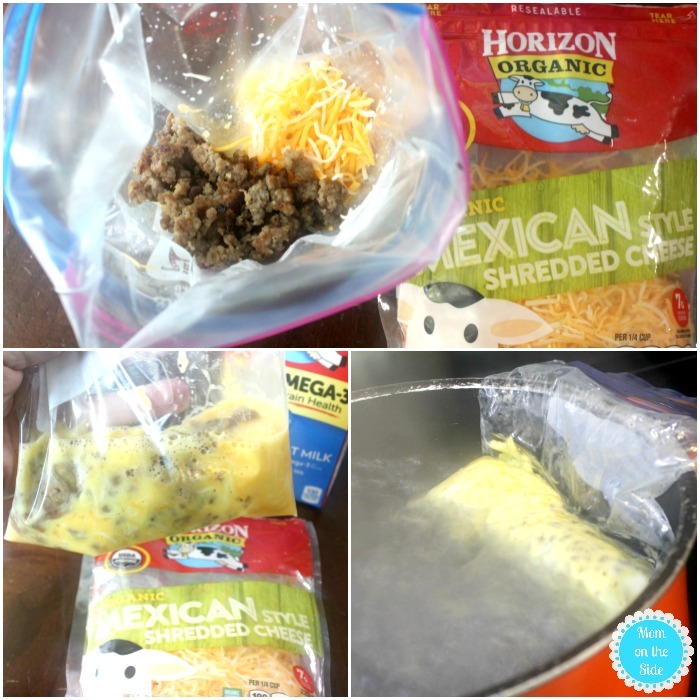 To make Cheesy Sausage Omelettes in a Bag you need freezer bags, eggs, milk, and any omelette and sausage. 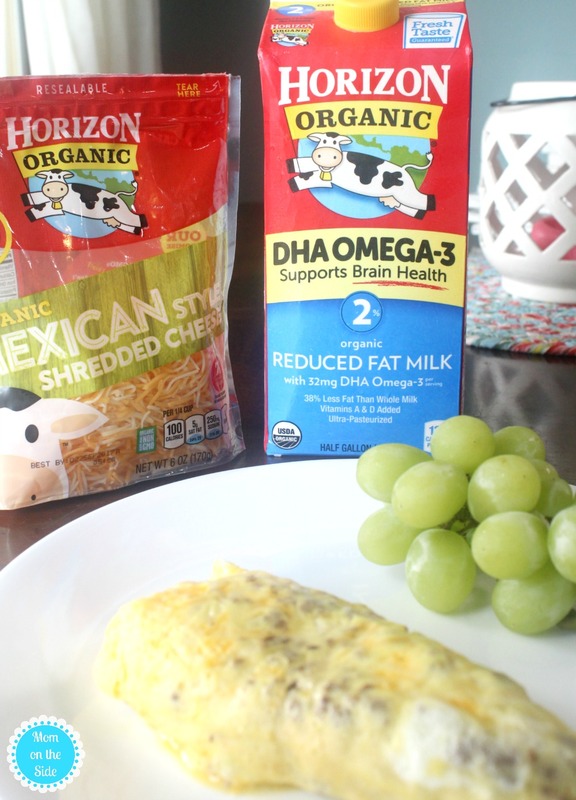 I picked up Horizon Organic Shredded Cheese Mexican Blend to give these Omelettes in a Bag some extra flavor. Have you tried Horizon organic shredded cheese? It’s yummy and melty, and available in 6-ounce bags of cheddar, Monterey jack, and mozzarella as well. I’m looking forward to trying it for homemade pizza night. First, start boiling a large pot of water and cook sausage. In the meantime, put a freezer bag down into a cup to make filling it easier. Crack two eggs and break them into the bag. Next, Pour in 1 tablespoon of Horizon organic milk. Remove the freezer bag from the cup, squeeze out any air, seal shut, and mix. Once mixed, open the freezer bag and put it back into the cup. Now add in 1/2 cup Horizon Organic Shredded Cheese Mexican Blend and 1/3 cup of cooked sausage. Remove the freezer bag from the cup again and mix everything together. After everything is mixed together, drop the bag into the boiling water and let it cook for 15-18 minutes. The reason I love Omelette in a Bag is that you don’t have to stand over it watching it cook. Once you drop the bag(s) in the water, you can go about your morning routine until they are done. When the time is up, and the egg looks completely cooked, remove it from the water. The bag will be hot so use tongs. Let it cool for a minute, then open the bag, and dump onto a plate. Boom, Omelette in a Bag. 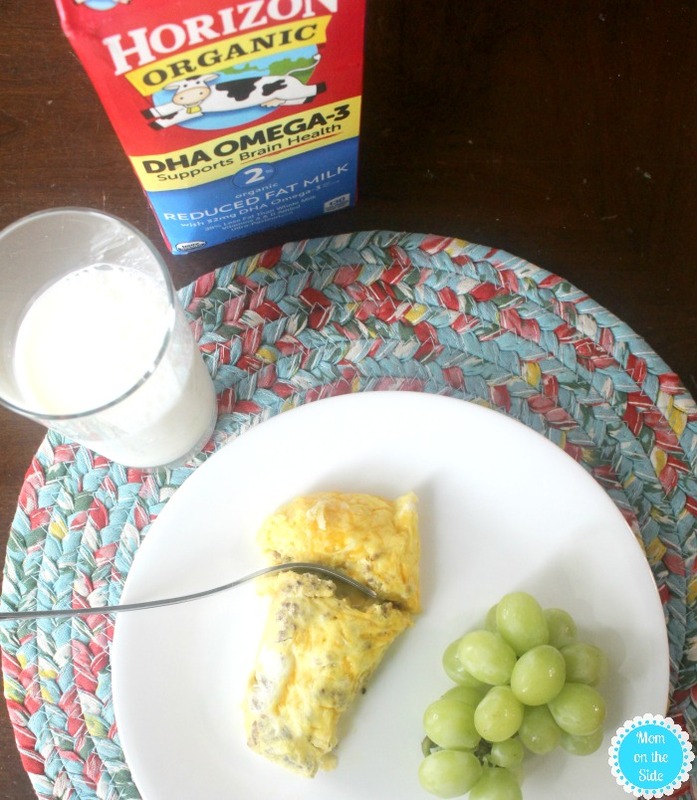 For a well-rounded breakfast, pair this Cheesy Sausage Omelette in a Bag with some fruit, and a cold, creamy glass of Horizon organic milk. Horizon products are great for lunch too, and a good choice for your family and the environment because Horizon organic milk comes from cows not given growth hormones* or antibiotics. The cows are raised on farms that follow sustainable organic practices. 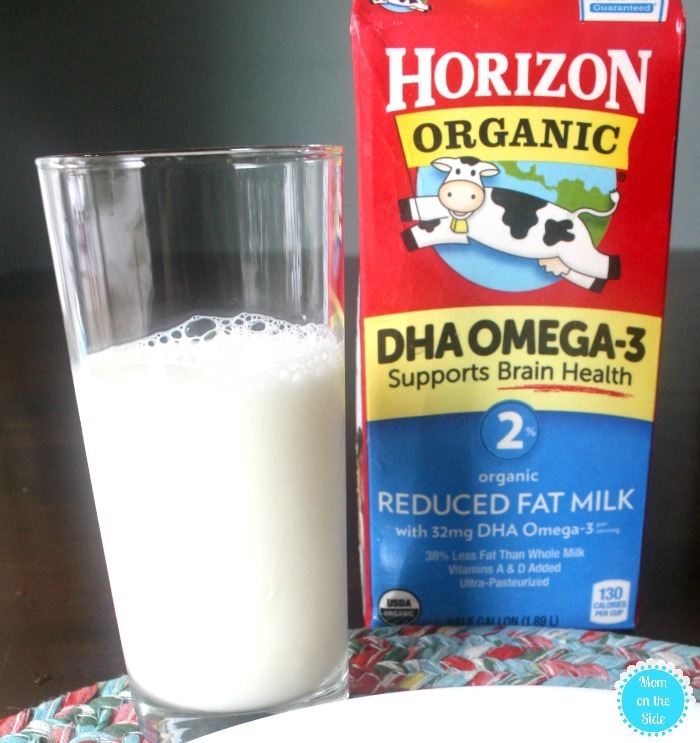 You can find Horizon organic milk available in gallons and half gallons at Walmart, as well as Horizon organic shredded cheese, and other products. Get more breakfast and lunch ideas with Horizon® to make the back to school transition smoother! Mix two eggs and milk in a freezer bag. Mix in cheese and sausage. Squeeze out any air, seal, and drop in pot of boiling water. Let it boil for 15-18 minutes. Dump on a plate and eat.